This chilly scene, Boulevard Montmartre: Winter Morning painted by the artist Camille Pissarro in 1897 is one of the last great Impressionist canvases. It also marks the symbolic meeting point between nineteenth-century metropolitanism and mechanized twentieth-century modernism. In his later works, this piece in particular was painted just six years before his death, Pissarro turned his hand to the challenging, bustling cityscapes that had previously only been attempted by Monet and Caillebotte. Renting rooms in Paris, Rouen, Dieppe and Le Havre, Pissarro spent his time and talents in his final years approaching the dynamic boulevards, squares, rivers and bridges of a rapidly modernizing Northern France. Like Monet, he painted variations on a number of recurrent themes, and repetitions of the same subject or the same view to determine the differences in light. Having abandoned his Neo-Impressionist work with fellow artists Georges Seurat and Paul Signac on the basis a perceived excess of artificiality, Pissarro was forced also to put a stop to painting en plein air, outdoors. Suffering from a persistent eye infection, the ageing artist was forced to paint the outdoors while gazing from the window of a hotel. Yet, the tragic physical decline of a this great talent gave life to some of the most epiphanic and enduring images of the city ever to be committed to canvas. Boulevard Montmartre: Winter Morning is a painting that establishes order in social chaos. It is a paradoxical and beautiful urban vista, remarkable in its spatial composition, with deep perspectives covered by traffic and framed by the architectural cleavages of Baron von Haussmann, all bathed in the harmonious atmosphere of city light. Having spent almost a decade in the rural idyll of �ragny, Pissarro began work on depicting the "grands boulevards" that were rapidly changing the face of social life in the city. Following the Paris revolutions of 1848 and 1871 city officials began to turn to urban planners for the means to quell civil unrest. Realizing that the labyrinthine medieval streets were the ideal setting for guerilla warfare and a nightmare to infiltrate, the city appointed the divisive figure Baron von Haussmann to clear the ancient quarters and cleave immense boulevards through the city. The look, feel, shape, and movement of modern Paris relies almost entirely on Haussmann's renovations. 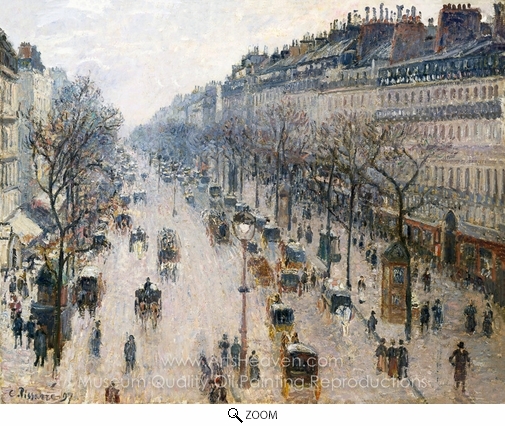 Pissarro's metropolitan views of 1897 capture the changing pace of life on these newly laid streets which had been literally carved out of the destruction of older districts. Urban life had been changed forever and, curiously, it was the primarily rural genre of Impressionism that best captured the pace of change. 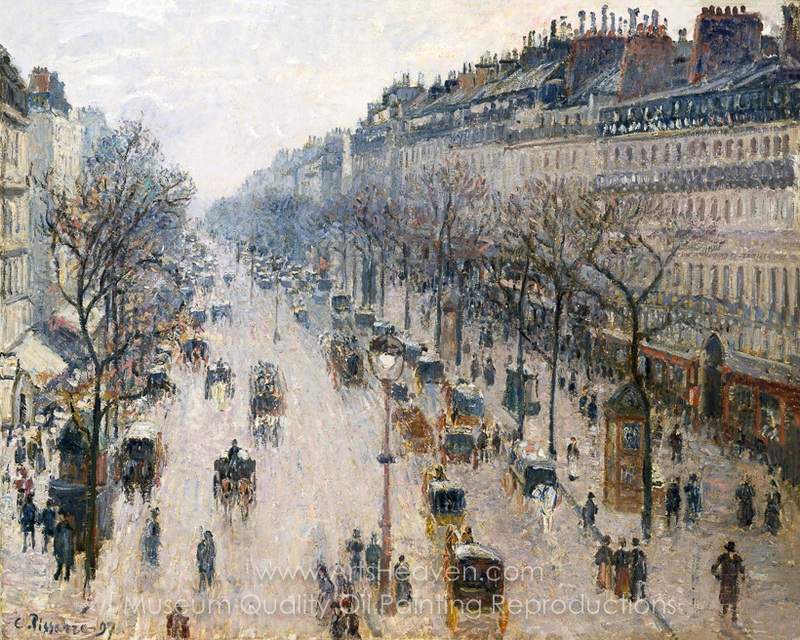 Decorate your home or office with our beautiful museum quality art reproduction of Camille Pissarro Boulevard Montmartre: Winter Morning painting. Why settle for a print, poster, giclee or canvas transfer when you can grace your walls with a genuine oil on canvas painting reproductions for sale at up to 75% below gallery prices. You are commissioning an authentic hand-painted oil painting on quality artists canvas. Painted by professional artists brushstroke-by-brushstroke with attention to all details. Order your Masterpiece today and get Free Shipping to your door direct from our studio.